Professor Matt Bradshaw is a native Texas who was born on the grounds of Fort Hood during the Vietnam War. He grew up in Fort Worth, and now lives in China Spring with his wife Cerrie and their two children, William and Kailey. Dr. Bradshaw earned a B.S. degree in sociology from Texas A&M University in 2002, and a Ph.D. in sociology from the University of Texas at Austin in 2008. He then completed a 3-year postdoctoral fellowship at the University of North Carolina at Chapel Hill, and served on the faculty at Duke University from 2011-2013. He joined the Baylor faculty in the fall of 2013. Dr. Bradshaw's research focuses on health and well-being, with an emphasis on: (1) the connection between religion and health; and (2) the interplay between genetic and environmental influences on health and aging. 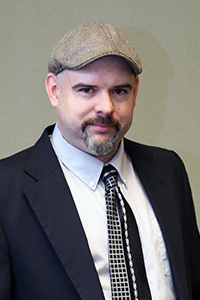 He has also published research on the biology of religious practices, beliefs, and experiences. Dr. Bradshaw's teaching interests include population health, introduction to sociology, research methods, and statistics. Hill, Terrence, Matt Bradshaw, and Amy Burdette. Forthcoming. "Religion and Biological Functioning across the Life Course." Handbook of Religion and Society. Bradshaw, Matt and Blake Victor Kent. 2018. "Prayer, Attachment to God, and Psychological Well-being in Later Life." Journal of Aging and Health 30(5):667-691. Blake Victor Kent, Matt Bradshaw, and Jeremy E. Uecker. 2018. "Attachment to God, Forgiveness, and Mental Health Outcomes in Older U.S. Adults: A Longitudinal Study." Research on Aging 40(5):456-479. Bradshaw, Matt, Blake Victor Kent, W. Matthew Henderson, and Anna C. Setar. 2017. “Subjective Social Status, Life Course SES, and BMI in Young Adulthood.” Health Psychology 36(7):682-694. Blake Victor Kent, Matt Bradshaw and Kevin D. Dougherty. 2016. "Attachment to God, Vocational Calling and Worker Contentment." Review of Religious Research 58:343-364. Dr. Bradshaw's Full Curriculum Vitae.